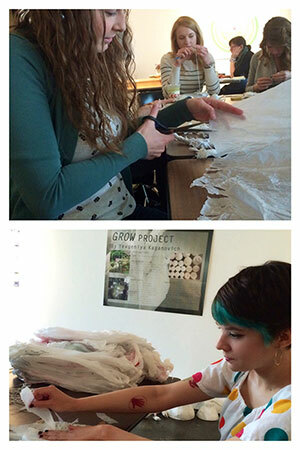 Graduate students (and teaching assistants) Kara Hendrickson (lower photo) and Leigh Wilcox (upper photo) attended Professor Yevgeniya Kaganovich’s grow workshop at UWM’s Institute of Visual Arts (INOVA) on Friday 24, 2015. As participants in the workshop, Hendrickson, Wilcox, and other attendees collaborated in creating the components that Kaganovich employs in making plant-like forms from recycled plastic bags. The project highlights the beautiful and creative possibilities of seemingly useless trash like plastic bags. Hendrickson and Wilcox participated by pulling and stretching thin strips of plastic into string. The next group crocheted the string into organic branch-like forms. A third group cut the patterns for the main forms. These elements will be assembled by Kaganovich and added to the current growing installation at INOVA as part of the exhibition Placing the Golden Spike: Landscapes of the Anthropocene. In addition to the workshop at INOVA, Professor Kaganovich also leads grow sessions at the Lynden Sculpture Garden. Hendrickson and Wilcox have both interned at INOVA under the supervision of director Sara Krajewski.